As 2015 slowly approaches its end, so are we at Sin Sin Fine Art coming to the end of a long and rigorous transitional period. We have finally settled from both the relocation of Sin Sin Atelier to Wong Chuk Hang and the renovation of Sin Sin Fine Art on Sai Street and we are extremely excited to share new chapter and experiences with all of you in 2016. 'Reach for the HeART' Annual Luncheon at 4th December once again was a big success, supported by all of you who joined us at the China Club. We would like to express our sincere gratitude for your continuous support and generous contributions. 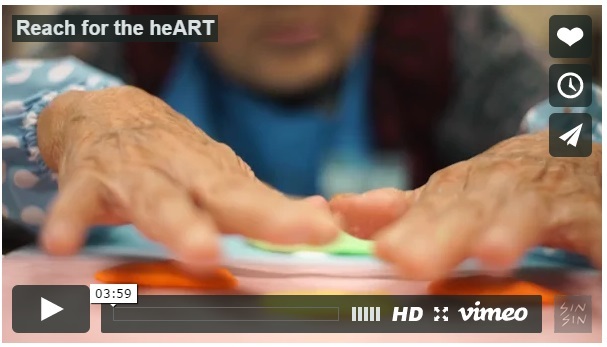 Please click on the image below to explore the video of one of the free art workshops in public hospital and see how effectively it brings joy and love to the elderly. The 7th Annual Luncheon of 'Reach for the HeART' at December 4th once again was a big success, supported by all of you who joined us at the China Club. Wonderful time was had by all as we gathered for a good cause. We were blessed with Anam Thubten Rinpoche's presence that day, sharing his illuminating wisdom through his speech. On 8th December, Anam Thubten Rinpoche shared the idea of having two lives in one human body in Tibetan tradition. This is a transformation we all have the choice to go through. By cultivating awareness and self-knowledge, we can undo our internal karmic bondages and become a new person who has more love and wisdom. Such inner change can be so profound that we can become a totally new person by leaving many of our old habits behind. The talk ended with Tsok, a Tantric Buddhist feast ceremony and Newar Vajra dance offered by LiAnne Takeuchi Hunt. Thank you for sharing the blessing night with us at Sin Sin Fine Art. We came together to savour the amazing artworks by the French artist Louis Cane. We celebrated our fortune to be able to directly witness such inventive, rejuvenating artworks. Delectable French wine and cheese from FICO accompanied our evening together. The exhibition marks a blessed 12-year history of his collaboration with Sin Sin Fine Art and in celebration a book titled "BEYOND HEAVENS" will be launched at the same time. By the end of the year 2015, the Indonesian President Mr. Joko Widodo kindly invited religious leaders, intellectuals and humanists to the Presidential palace. The meeting aimed to bring attention on the development of Art & Culture in Indonesia. The well established Indonesian Artists Nasirun and Tisna Sanjaya represented by Sin Sin Fine Art were invited all among the Scholars and Cultural groups with Radhar Panca Dahana, Franz Magnis-Suseno, Nungki Kusumastuti, Yockie Suryoprayogo, Butet Kertarajasa, Mohammad Sobary, Tamrin Amal Tomagola, Mr. Haidar Bagir, Mustafa Bisri, Sindhuanata, Toety Heraty N, Mr. Komarudin Hidayat, Mr. Made Winata, Mr. Syafii Maarief, Nyoman Nuarta and Sys NS. Please come visit HAKUSASONSO HASHIMOTOKANSETSU GARDEN & MUSEUM to check out the artist’s recent creations! Art Experience Gallery will present a solo exhibition of Hong Kong artist Wong Tong – entitled “Metal Storming”, this exhibition will feature Wong’s latest paintings as well as his early work since 2005, some of them will be presented in a form of installation for the first time. Wong Tong has been actively practicing in art and exploring a large variety of medium in his work. It is rather surprising to see such a young local artist who has an old soul, his recent paintings show a strong formation of composition, texture, observation, belief and creative energy. Wong’s latest work is a new development from his drawing and painting series “Face Landscape” since 2005, it further enhances the path in which he tries to connect the outside world with his inner source and express his personal feelings on canvas. The exhibition title “Mental Storming” may describe best the distinctive but intangible quality of the artist’s spiritual work and mind. Living and working across three countries, Australia, Indonesia and Germany (his place of birth), Peter Dittmar has developed a passion for intercultural translation. Through the exploration of postcolonial identities, a hybridity is formed between the constructs of East and West. Where once separate spheres of representation existed, layers of influence merge to create a fusion of cultures. Manly Art gallery & Museum presents an exploration of Dittmar’s development of these concepts over the past decade. The Christmas day in 2015 is very special for the Balinese Christian and Catholic followers who have been waiting for quite a long time - The full moon is on the exact same day as Christmas for the first time since 1977. You have to wait another 38 years until 2034 for next Full moon Christmas. During this day both Christian and Hindu followers are busy with their religious activities and festive. Interesting enough, on this day Moslem all over Indonesia will also celebrate the birthday of Prophet Muhammad.